The highest building from Shanghai is Shanghai Tower. Shanghai Tower, the tallest office building in the world, is a project that required an investment of $ 2.4 billion. Is the highest building in China and the second highest in the world, but also one of the most ambitious architectural projects ever created on earth. Shanghai Tower has a height of 632 meters, is located in Lujiazui financial area from Shanghai, the second most important city from China and also the financial capital of the Asian state. Shanghai Tower is located in a city dominated so far by financial building Shanghai World Financial Centre (492m) and Jin Mao Tower (421m). The building with a futuristic architecture thus entering into a top of the tallest buildings in the world with over 600m, after Dubai's Burj Khalifa (828m) and ahead Mkkah Royal Clock Tower in Saudi Arabia, with a height of 601M. 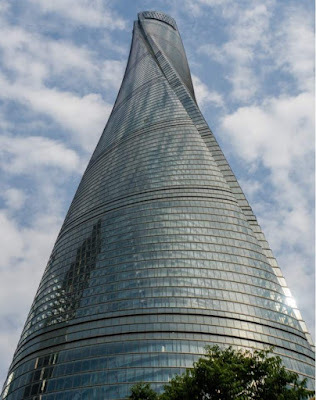 Shanghai Tower, a project started in 2008, required an colossal investment of 2.4 billion dollars project with a total area of 380,000 square meters. Shanghai Tower was designed by the American architect Gensler. According to him, the facade curved and spiral shape of the building symbolizes the "dynamism of modern China." Shanghai Tower is spread over 128 floors and will include new "vertical neighborhoods", with an atrium full of nature, called "Sky Lobby".